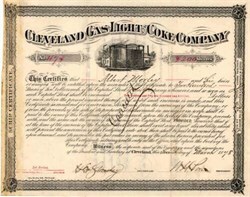 Beautiful certificate from the Cleveland Gas Light and Coke Company issued in 1878. This historic document was printed by the American Banknote Company and has an ornate border around it with a vignette of storage facility. This item is hand signed by the Company’s President and Secretary and is over 127 years old. In 1909, the East Ohio Gas Company merged with The Cleveland Gas Light and Coke Company, and The Peoples Gas Company of Cleveland. The consolidated company used the name of The East Ohio Gas Company. On January 28th, 2000, The East Ohio Gas Company officially became The Dominion East Ohio Gas Company.